In today’s economy, it is critical to get the most productivity from every employee. Companies must be certain that every employee performs to the best of their ability and delivers significant value to the organization. One major issue that virtually every business struggles with is the challenge of dealing with employee performance reviews. Employee performance reviews were once seen as a necessary part of managing employees, but let’s face it – managers and employees alike dread evaluations. The time it takes to write, administer, analyze, and then package them up for delivery is enough to cut anyone’s productivity by a huge percentage. This approach toward employee performance management simply isn’t as effective as it should be. 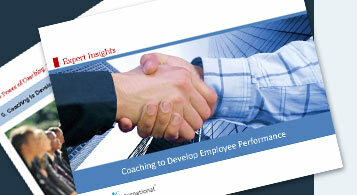 The most effective way for managers to increase productivity is through employee coaching. Profiles International provides tools that will help you tailor your coaching approach to meet the needs of every employee. Our employee performance solution gives you insight into the core characteristics of individual employees and then uses that information to assess their fit with their job, manager, and team. This fit analysis identifies an employee’s strengths and also looks for areas that may present challenges to the employee (i.e., difficulty performing in their job, possible conflict with a manager or team member). Improving employee performance is one of the most valuable activities you can do for your business. Help people be more effective and productive than they are today. Drive the overall performance of your organization by coaching employees to develop the skills they need to be better at what they do. Effectively communicate with each employee. Learn how to communicate with your employees — it increases morale and productivity. Learn how to handle manager/employee conflicts. Prevent unnecessary turnover due to poor manager-employee relationships. Build effective relationships with remote employees. Manage employees in any location and move beyond the face-to-face way of getting to know them. Understand and improve employee engagement. Inspire your employees to perform based on the individual factors that motivate them. Redeploy talent when your business significantly changes. Understand the core characteristics of employees so that you know where they fit within the organization, even in times of change. Motivate people to do what you need them to do. Learn how to make your employees productive and keep them motivated to do their very best. Learn how to handle diverse manager/employee dynamics. Empower employees and managers to learn from each other and use their differences to propel the team to success.